Jeshika Ramchund opened the second day's morning session at the 24th Annual FIDIC-GAMA Conference on Infrastructure by unpacking the power of technology to disrupt both industries and the notion of the profession. 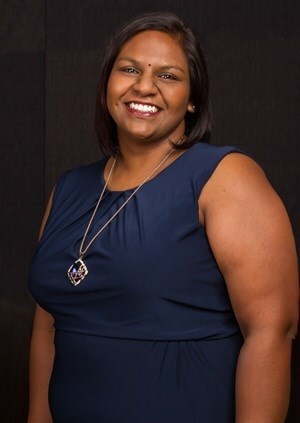 Ramchund is a senior civil engineer at Bosch Projects and serves as vice chairperson of the GAMA Young Professional's Forum. It's a matter of disrupt or be disrupted, she emphasised, as innovative competitors have the potential to oust even well-established businesses. "The acceleration of innovation and the velocity behind disruption is very hard to anticipate," she explained, but "the most surprising thing about disruption is that almost all successful attacks originate from industries that formerly had nothing to do with the business sector that they are now revolutionising." Ramchund used the well-known examples of Skype, Alibaba, Uber and Airbnb as disruptors that emanated from outside the industries in which they now operate. She highlighted a lack of innovation and effective leadership as the main drivers behind the downfall of some once globally established brands, including Kodak, Blockbuster Video, and Xerox, all of which resisted change. While Xerox initially, in its robust years, invested in research and development via the Palo Alto Research Center, it never capitalised on its innovations. Ramchund noted that sometimes innovation is a management issue: "You may have the brightest innovators in your company, but if your managers can't implement those innovations, you have nothing." The internet's potential disruptive effect on traditional business models isn't restricted by any means to specific industries, she pointed out, highlighting those cited by Richard and Daniel Susskind in their book The Future of the Professions: How Technology Will Transform the Work of Human Experts - they range from the education sector to the built environment. The authors predict two potential futures for professions: one in which we use technology to optimise what has always been done traditionally, or two, in which increasingly capable machines actively displace professionals. Those in the engineering space need to consider the impact of the fourth industrial revolution, said Ramchund, as it has brought with it technological advances that allow computers the ability to simulate expert knowledge and have the potential to disrupt the very notion of the professions. In the long-term, in answering the question as to whether there will be any jobs left for human professionals, "the optimistic view is that there's work today that only humans can do and new work will arise that humans and machines will do together. The pessimistic view is that, with machines becoming increasingly capable, there will be less and less work available for humans to do," explained Ramchund. The bottom line, she said, is that business leaders and senior management need to understand this changing business environment. Adapting to be able to deal with the digital age requires cultural transformation, embracing new technologies, and preparing for innovation. "Adapt," concluded Ramchund, "or get left behind." Go to www.fidic-gama2017.org.za for more info on the annual conference. For more info on FIDIC and its members, go to www.fidic.org. FIDIC-GAMA 2017 is currently underway at the CTICC, 7-10 May.